Stress in one form or another is the cause of any mental illness, therefore, the embarrassing stigma which can be associated with it is simply unwarranted. Every single person on the planet will experiences stress at one time or another whether they choose to admit it or not! and we all react differently to stress. Saying you have complete control over Anxiety or Panic Attacks is like stating you have complete control over the weather! Sometimes one of the ‘Big 3’ stresses rears its ugly head and Anxiety or Panic Attacks can be upon us! Yes, you are reading correctly! CORN is the bane of my existence and I really loved corn. Sigh! It’s not worth the attacks. I’ve noticed just how much corn affects me since going gluten free. Maize is one of the main ingredients in gluten free baking. The polenta I used to use as a substitute for flour and make polenta muffins all the while not making the connection. It wasn’t until I did a food journal did I realise that was a trigger factor. Then when my food intolerances blood testing results came back, it was confirmed I don’t tolerate corn, but who would think that’s a trigger factor? Yep, Soy is another food which triggers my anxiety. I’m ok if I have a little bit of soy sauce and I mean a tiny amount on the odd occasion with some sashimi, but anything more I have an attack! Also, there are gluten-free breads which use soy flour as well. And one other thing soy products do is give me a sore throat! Yes, you read that correctly. Soy Lectin is my nemesis! This too is a trigger factor for me, however, I am ok with fresh chilli? If I’ve had a big night on the Champagne/Sparkling wine the next day I can suffer and I think it’s the additive number sulphur dioxide E220 or one of the E220-E227 which can trigger my attacks. If I’m suffering from an attack, I’ll do a PH test and I’ll be too acidic therefore I try to get my PH back in balance with a green juice! If I’ve been drinking too much and not given myself a break my body retaliates and tells me enough is enough. That’s when I know I need some time off the booze! When I was 21 years old and living on the Gold Coast in Australia I was a full-time Nail Technician. My attacks got so bad there were days I couldn’t leave my apartment. I would close all the windows and blinds, scared people would see me! I would ‘hide’ in my apartment for days and panic, it was debilitating! Ironically before I lived in Queensland I used to only do my friends nails and at times I would have massive attacks, and never did I put the two together. It wasn’t until years later after I stopped wearing my nails around late 2007 early 2008 did I realise acrylic caused attacks. I was walking past a nail bar and instantly once I smelled that smell I got the adrenaline spike, then I had an attack. When I’m renovating properties, or helping others renovate there are certain chemicals that can trigger my anxiety. For example, the smell of an epoxy resin or paint thinner may trigger an attack. I used to smoke a lot of pot when I was in my teens and now just the smell can set me off and bring on an attack (this is one reason I was struggling when we lived in the Netherlands last year). For years in my teens I smoked pot even though it made me uneasy (so why did I smoke it? Because that’s what everyone was doing!). At 17 I stopped smoking pot and haven’t smoked it since. I love my coffee but I now limit it to no more than 2 per day otherwise I’ll get an attack as too much caffeine spikes my adrenaline and then off I go! If I’ve been doing too much traveling and not resting enough and eating properly it can on the odd occasion causes attacks. When I have bad gut health, my attacks are on the rise. I need to be very careful and try to maintain a balanced eating routine and have lots of probiotics and prebiotics to keep myself in a healthy way. Bad gut health is a sure way to trigger my attacks. If I’ve been burning the candle at both ends for days on end, then I might on the very rare occasion have an attack. However, if I’m in a certain environment where I can’t get enough sleep all the time, combine that with one of these other factors listed and I’ll have an attack. If I don’t exercise regularly then I will get attacks. Why? Because we as humans need to move, walk, run, stretch etc etc etc. The body needs to work so it can move the environmental stress build up so we can sweat, pee or poop it out (yeah you heard me!) that’s right! I know when people lie to me (most of the time) and when it’s someone close to me who I love and it affects me and my life, I struggle to deal with that. The emotional stress can cause me to have an attack. When I’ve lost someone I’m close to whether it’s a breakup or they’ve passed away it can cause anxiety. This is because I like most others will struggle with the loss and my body/mind is in shock. At times (not all the time) being in a very large crowd of people can set me off, I get uneasy and freak out being around that many people. I can feel suffocated and then I panic. If I’m in an environment where I don’t see the sunshine for weeks on end that can make me have an attack. This can happen particularly if a gas heater is being used in a room. If I think and feel like I can’t get enough air I start to panic, my adrenaline spikes and off I go… this might be due to the fact I was a chronic asthmatic as a child and there were times I couldn’t breathe properly! I once had a major panic attack in Thailand in a day spa getting a sea wrap because my body was wrapped up and then they put cucumbers on my eyes and the room felt a warm (there was nothing relaxing about that!!) = panic! Getting into a lift a then it fills with people can cause me to get anxious until I get out. I used to freak out sometimes when was flying (ironic given how much flying I do!). If I’m on a small domestic plane I can have an attack if it's full of passengers. However, on the big international boys, I feel okay because they are wide and long so I don’t feel so claustrophobic. I have a few massive fears like open bodied water, swimming in the ocean where I can’t see the bottom, sharks, heights, you know the normal things. They say face your fears. I say well that’s all well and good but I don’t need to right now thanks! I don’t like panic/anxiety attacks! What do my Panic or Anxiety attacks feel like? Sometimes when I’m having an attack my mind can get so carried away I can make myself worse! I can start to think silly things like the food I’m trying to eat may have been ‘poisoned’ or if I’m in a bar I might think someone’s put something in my drink! And then I make my attack worse and I feel a massive adrenaline spike which is bad! 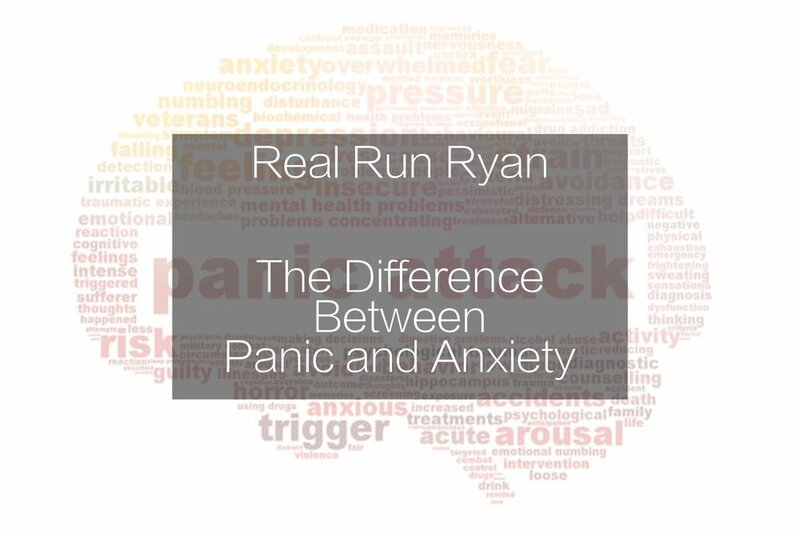 At the end of this blog, there’s another blog post from Real Run Ryan which can break down Panic vs Anxiety Attacks for you. So what does the ‘Big 3’ Stress Solutions Puzzle look like when it comes to The Top 23 Things That Can Cause My Anxiety or Panic Attacks? Over the years I’ve learned what my Panic or Anxiety Attacks are triggered by and sometimes on the odd occasion I can’t help but get attacks. I’ve learned they are not going to kill me. At worse, I hyperventilate so badly I could pass out… that’s it! They are not going to kill me (even though it feels like they might) but they can’t! The best way for me to deal with an attack is to start moving! Once I start moving and getting myself walking in fresh air I will slowly feel better. Moving for me is key, sitting down rocking in the corner of the room freaking out doesn’t do any good. For me, I MUST MOVE! It helps me with my adrenaline spike. If my attacks are so bad I don’t want anyone to see me I put on sunglasses and hat that way I feel like I’m hiding from the world out in the open. Also, I find having a green juice helps (I know some may roll their eyes but for me, it helps!). This is because it’s helping my body get back to its PH balance. Remember my motto for positive change is ‘Little Puzzle Pieces Create a Big Picture’… Therefore understanding what your trigger factors are will help you reduce or eliminate your attacks! Real Run Ryan did a great blog post called Difference Between Panic and Anxiety here it is!